It is nice when the answers for frugal and efficient living become simple and obvious, so as to free your mind for more complex and worthwhile pursuits. For example, when investing in stocks, Vanguard index funds is all you need to know. For cars, a compact hatchback like a Honda Fit will almost always suffice. The ultimate cable TV package is quite obviously no TV service at all at $0 per month. And for US mobile phone service, Republic Wireless has become my default answer for anyone who asks because it just plain works and the $5/$10/$25 unlimited pricing plan reigns supreme in value. I simply love how boring the mobile phone world has become for me: my phone works great, I never pay attention to usage, they never pull any stunts on me, and the monthly bill is a constant, negligible amount. Republic is becoming the Vanguard of mobile phones in my mind. The bland simplicity of their pricing scheme. No talk of “minutes” or “texting packages”.. you just use the damn phone as you see fit. I am hesitant to write about something so boring when it has already been covered on this blog before, but a new release from the company warrants this one last update. Republic has released a new phone that costs half as much as the previous new one, and readers have been asking me to review it here. So here we go! Until this month, you had to buy a $299 Motorola X running their customized software in order to use the company’s hybrid calling network. While the math still worked out in your favor and you’d save money, it still hurts some of us to fork over $300 for a depreciating smartphone, as beautiful as it is when you first open the box. But very recently, they released a new phone called the Motorola G, which is priced at $149. I assumed that it would be about half as good, and being a gadgety former engineer that I would be disappointed by the step down. Still, I dutifully requested that the company send me a review version so I could do some in-person evaluation for the benefit of curious Mustachaians. 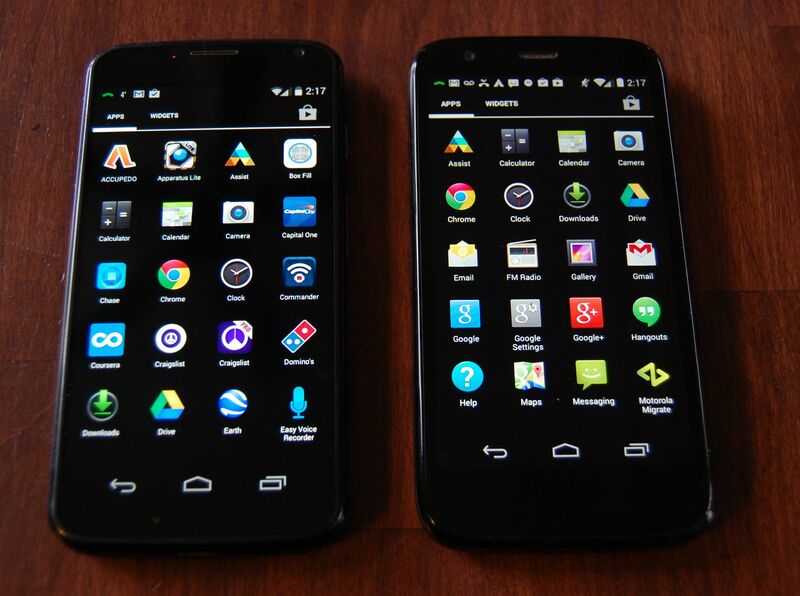 Moto X (left) vs. Moto G – screens were equally bright and clear. This Identical Twins experience continues as you pick up both phones to tap on some stuff, swipe back and forth between various screens, take some pictures and videos, play music, and make some calls. For typical use, there is no noticeable difference between these phones. Both are incredibly useful due to the full Google integration that allows you to talk to the phone in natural language: “Ok Google, when is my flight to Portland?”, brings up a futuristic summary with full details and realtime flight status, based solely on an old Southwest Airlines email receipt from a ticket purchased weeks ago. “Navigate to the Shiner Brewery in Texas” brings up full directions to the Spoetzl brewery, a 16 hour drive from here. The GPS fires up, 3-D satellite imagery loads and shows a bird’s eye view of my current location with a line showing the way, and we could be on a roadtrip within minutes. Republic service uses the Sprint network when available, which blankets the US pretty well (voice and 3G data almost everywhere and 4G data in the cities). But if you don’t have Sprint coverage, the phone will automatically roam to the nearest Verizon tower for unlimited voice (plus up to 25Mb/month of roaming data) – seamlessly and at no cost to you. So it is really like having both Sprint and Verizon accounts. If you’re connected to Wi-fi, the phone uses that (and thus the Internet) for all its calling and data needs. This means buildings and basements which were formerly outside of cell range are now great places to make a call. It also means the phone works internationally at no cost whenever you have good Wi-Fi. You can make and receive calls exactly as if you were still in the US – your friends will never know. I tested this feature successfully in Ecuador last year. Moto X (top), vs Moto G (bottom). Click for full image if you want to compare in detail. Active Display is a periodic update where the phone gently fades in stuff like the time, date, and your calendar/SMS/email/twitter status even when the phone is sleeping. It also does so immediately when you pick it up. Sort of convenient, since it saves you from unlocking the phone. “Yes”, I said, somewhat off guard. It answered, and I had a surreal speakerphone conversation with Mrs. Money Mustache while riding my bike with the phone in the pocket of my jeans. The X also has a nifty feature where you simply twist your sleeping phone back and forth along its vertical axis a couple of times to immediately activate the camera. Better for catching short-lived moments and looking less dorky doing so since the twisting motion can be done subtly with the phone at your side and then Boom, you take the picture before anyone notices. Even with these things missing, the Moto G is an amazing and intuitive piece of technology, and is a good choice for those of us who are not online media extremists for whom tiny details* make a big difference. So Republic wireless service just became drastically cheaper**, and I welcome the new option. Republic has now added a third, even less costly phone called the Moto E. Smaller specs in exchange for a $99 price tag. While it won’t be the choice of most 20-something software engineers, this simpler smartphone may be a great choice for people who have no need for gadgetry, or families who want to give phones to their kids and relatives. If you’re still paying over $25 for your mobile phone service, you can remedy that situation with this link. You can also find the previous Republic article from November 2013 (which also covers Ting) here. * So which one would I buy? In my pre-blog life, it would have been the G, hands-down. Now that I use a phone so much for this gig, especially taking pictures that people actually look at sometimes, I’d have to suppress my natural cheapness and spend the extra for the X. It’s the usual tool-vs-toy calculation. Just remember that within a year or two, even better phones will cost even less than these ones, so weigh the steep depreciation on a per-photo (or per gee-whiz) basis. ** you can also now buy a used phone from another Republic member if you can find one and re-activate it on a new account, a further increase in frugality. Great review of the new phone. I currently use Virgin Mobile on the Sprint network, $35/mo for unlimited text/data and 300 calling minutes (which I almost never use). What I like is that for $15 I can make my phone (HTC Evo 4G) a mobile hotspot for the month, which is nice when the kids want to play their internet connected devices on those long roadtrips to visit family. However, Sprint’s network is still somewhat spotty, so the option to roam on Verizon’s network with Republic may be worth it if we move (maybe to CO!) and the Sprint service in our location isn’t great. Coincidentally, I happen to be testing a FreedomPop device at the moment that fills in this need for Republic readers that also need tethering: it converts the Sprint 3G network into a mobile hotspot. I’ve been using a Freedom Pop device here in LA area for the last 6 months and it works well. Cost me maybe $18 with shipping and $0 per month for up to 500mb. Their site is little gimmicky with up selling and hard to navigate but you can’t beat the price of service if you’re careful with usage. I stick to wifi at home, office, and clients so my use of Freedom pop is mainly in my car. I use Ptel pay as you go service on my Nexus 5 per a recommendation from the forum here. For the past 6 months of service I averaged $5.13 per month. I agree Scott – the marketing method is awful and I’ve been encouraging them to change this. They made some improvements for visitors coming in via the “mustache” links above, and there are more coming – maybe even sitewide if people like us convince them that simplicity wins over gimmicks of any sort! That’s exactly the reason I went with Republic Wireless over FreedomPop. While I was intrigued by the option of basically free cell coverage each month, I could not get past how sketchy their website is. It just doesn’t look or feel like a legitimate company to me. I continued researching different options, found RW, and haven’t looked back. Great article! I’ve been using freedom pop for almost a year and it has been amazing. I use the photon model, which has a footprint not much bigger than a business card. It only connects via 4g but living in DC it doesn’t negatively affect my coverage at all. Freedom pop has allowed me to continue to use a “regular” flip-phone without having to pay for data. The 500 mb limit it easy to maintain with typical use of email, VOIP texting (viber) and occasional skype or Google voice calls – of course just when I’m not already connected to wifi. I even bought mine on ebay for half the retail price. For metropolitan areas with 4G coverage it’s a great option. Tethering just means taking the cellular data network and converting it to a signal your gadgets other than phones (such as a laptop computer) can make use of. This allows you to, for example, be a passenger in a car or train and work uninterrupted on your computer.. or provide your own internet access in a hotel which normally charges for access. Now there’s an even more frugal choice. Motorola announced the Moto E today http://www.engadget.com/2014/05/13/motorola-moto-e/. You give up a few more bells and whistles, but $129 off contract is an amazingly low price. Cool.. except Republic will need to port their custom Wi-fi calling software to the Moto E before it will work with their plans. Republic/Ting clarification needed: Your previous article on them, and at least one comment here, refers to the fact that Republic and Ting jump to the most appropriate network. If you go to their web sites, however, they say they are straight up Sprint, which is very bad in my area. In addition, if you call Republic and ask them if they work in Canada, they will say “no.” This is the opposite of what your original Republic review says. Can we re-substantiate the network jumping/Canada capabilities of these carriers? It’s the difference between being able to use these networks, and not, for a lot of people. Ting roams on Verizon voice only. If you have any Sprint signal at all it will not roam (or will switch back and forth as you lose signal). Ting does not support Verizon data. Otherwise Ting only uses the Sprint Network. Ting supposedly supports some international roaming, but I’ve never looked into it so I’m not sure. Check their website for details. Republic Wireless also roams on Verizon (voice and data), but (at least in the past) their customer agreement said you could only use like 50MB of data or you’ll get shut down. Again, any Sprint signal at all, and the phone will stop roaming. Republic Wireless should work on WIFI anywhere world wide, but I don’t think they have international cell agreements. If you have crappy Sprint coverage, then don’t go with a Sprint MVNO. If they do support Verizon roaming, and you use it a lot you will get dropped as a customer. Obviously, you need to take your wifi coverage into consideration when making the decision (I use Wifi calling on Ting too, it just isn’t integrated with the carrier). I have the same problem or I would all over this. Does anyone know if you can teether off a moto on republic? Republic Wireless doesn’t allow tethering. Doesn’t mean you can’t do it, but it would be against the terms of service. Yes! I have been visiting and revisiting Republic’s website with the same research question in mind. Sprint coverage is terrible in my area, and I just can’t/won’t switch from Verizon unless I feel more sure that I will be able to get service when I am out and about and unattached to my wifi networks. Do tell! Thanks for keeping us up to date. Then don’t switch. Check out PagePlus. It uses Verizons network at half the cost. Can’t speak for RW, but I can speak as a TING customer. TING works on any network for voice (and I believe texts), but will NOT roam for data. Republic does the network jumping for both voice and data, but apparently Ting does so only for voice (your data will just be shut off until you hit the next Sprint tower). I’ve just asked Republic if the Canada thing still works – it turns out that feature has been shut off for lack of interest. I tried! Wait, what? So I could cancel my service with my Canadian carrier, make the one-hour drive across the border to Buffalo and sign up for RW, and my phone would work in Ontario (possibly, assuming RW replies that it still works here) like it does State-side? I assume I would need a US address – but that could be arranged. Canada use is a point of issue on the RW boards recently. They have “fixed” the bug and there is NO cellular or data use in Canada. Only works on wifi. Great timing on this article, because I was just talking to my husband this morning about switching to Republic Wireless when our current Verizon plans run out. We don’t get fabulous reception at home or at work — two places where we need it the most, and two places where we have excellent WiFi available. I looked at coverage in my area, and it’s all 4G! Now, I think the only decision we have to make is whether we both “need” a better camera or not. 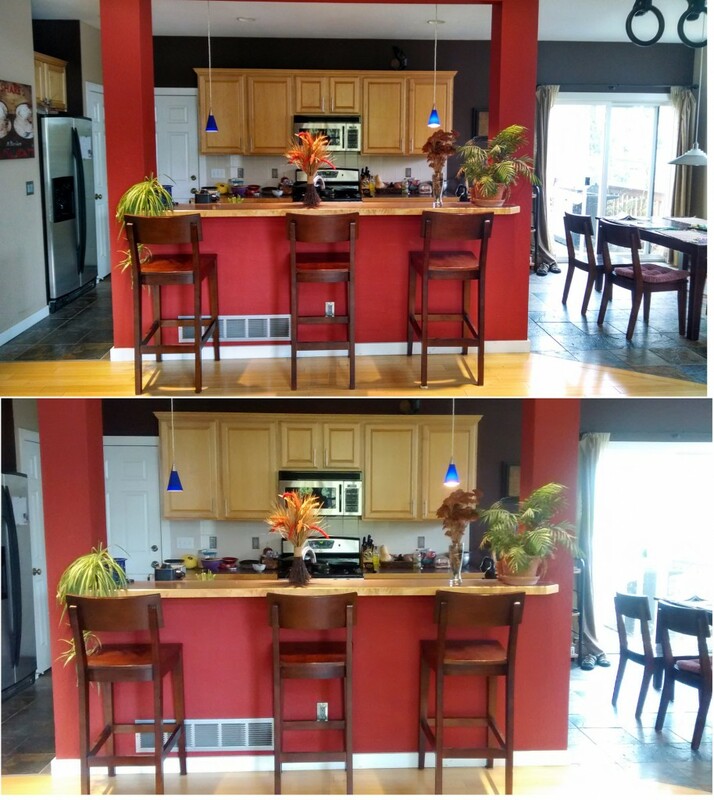 With a 4 year old, we are constantly snapping impromptu photos in all sorts of terrible lighting (I noticed how sharp the sliding door is in your first photo, compared with the backlit blurriness in the second photo). We have another child on the way, so I suspect we’ll be using our cameras more and more. Yes, it’s a $300 difference (for two phones), but that’s what we currently pay for 2 months of Verizon service. Ouch! We did the math and found it was cheaper to pay the Verizon early termination fee and switch to RW than to wait until our contract was up. I jumped on the MMM and Republic Wireless bandwagon when the Moto X came out and the money savings is almost like getting a wireless phone for Free after 6 months after coming from Verizon. Moto G looks great might get one for my parents, looks great. My wife has a moto G it’s a great phone. Its almost the right price, here is hoping the moto E is cheaper. Thank you for this additional review. I have used the Moto X on Republic for several months now in northern New England and had no issues with the network coverage. We are now moving my husband from AT&T to Republic and I appreciate this perspective. He does not need a better camera and the additional bells of the X, so we’ll likely get him a G. Thanks again! Another northern New Englander here…. I live in a pretty rural area and the best coverage in my area is on Verizon. I switched to Republic Wireless earlier this year and have also not had any issues with coverage. I’ve had a few dropped calls when en route from home to work, but there is a notorious dead spot on my route where I’d occasionally drop a call when I was on Verizon too. The calling/texting over wi-fi works great most of the time. However, I do get a higher than usual number of “wrong” numbers. I put “wrong” in quotes because the people on the other end are not dialing incorrectly, their calls are getting mis-routed to my number somehow. Hard to complain though for $10 a month! Hi, I am considering switching to Republic Wireless. I live in NH, in an area that has good Verizon coverage, but not Sprint. Do you think this would work okay for Republic? Thanks! I’ve mentioned this hundreds of times. Please check out PagePlus. It uses the Verizon network AND is cheaper than RW in normal every day use. Where are you in northern New England? I’m looking to get off an AT&T contract and love the idea of Republic but it looks like there is virtually NO sprint coverage in Western MA and VT, so based on some comments above that I will get kicked off of Republic if I spend the majority of time roaming on the Verizon network it makes me nervous. I live in WMass and have the Republic Moto X for nearly a year. Before purchase I checked the coverage map on the website and it did indeed look kind of sketchy however given the 30 day money back trial I decided to take the chance. I was fed up with Verizon. Happy to report service has been outstanding. I’ve had service en route to Burlington, VT, Burnham, ME, Southern NH. Service is in and out in the hill towns of WMass but it was that way with Verizon as well. Hey, some folks here still have only dial-up available! I’m so glad you posted this. We’re in central New England, but travel to northern Vermont frequently. I was afraid of losing service in the Notch area, but it sounds like Republic works fine up there. Nice to see RW rolling out a cheaper phone option. Paying $300 for a phone sounds nuts to me, though $150 is not exactly frugal either. Still too fancy so I’ll be sticking with my $50 Pantech from Craigslist and a $10 per month Airvoice Wireless plan. Pantech is a great smart phone that in real life use works as good as the Moto G (speed, pictures, memory). For that $10 I still get plenty of data when needed – like when I’m travelling and need data to get GPS navigation and maps. Same with occasional email check and browsing the internet. Most of the time I’m on free WI-FI so data is turned only occasional y. Also, unused balance ROLLS OVER every month and does NOT expire. Currently I have a credit balance of over $50 so even if I have a month that is heavy on calls, texts and data I won’t be paying anything extra! So far, that’s the most frugal plan that I found that fits my needs. $120 a YEAR on ATT network with talk, text, data is hard to beat! Any way you look at it – if you are on a contract now, switching to Airvoice, RW, Ting, StraightTalk or any other prepaid plan should save you money. Then it just comes down to how fancy you want you service/phone to be. Also, don’t forget to check RW coverage in your area before you drop $$ on the phone. The Moto G is also a great option in Canada on Wind Mobile if you can import the US GSM variant. 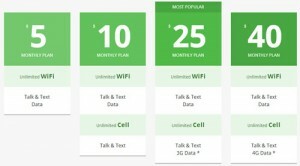 The most frugal yet full featured cell phone plan in Canada. Unfortunately Telus and their “budget” brand Koodo got Moto G exclusivity in Canada and made it ridiculously hard to get a Wind compatible Moto G in Canada. Loving mine, though. Mostly I love the money I’m saving. For those who miss the Motorola Touchless Control features, there are third-party apps that emulate this functionality (and then some!) Tasker and AutoVoice together cost about $10 in the app store, and can do ten times more stuff than the Motorola software. Works on almost any Android device. There is no app available that can truly emulate Moto X’s touchless voice control. The key to the Moto X’s feature is that they have a dedicated hardware chip that listens for your voice while the rest of the phone is in a deep sleep. The hardware chip uses very little power. While software can provide the same “always listening” functionality, it will do so while consuming comparatively significant power and reducing your battery life substantially. I’m a convert with the Moto G! I had an old phone that I got for free (Google Nexus One) and I was paying $30/month to T-mobile, so making the switch to a $300 phone didn’t quite make sense. I was really excited when I learned that I could have a really solid, high quality smart phone for only $150; it will pay for itself in a few months, instead of a few years. I’m really excited for $10/month, and once the phone is “paid off,” I could upgrade to the $25/month +data plan guilt free. No complaints so far, and RW seems really excited to have me as a customer. Just made the switch to the Moto X on RW. So far so GREAT! I don’t miss my iPhone or AT&T at all. I chose to try the $10/month plan since I’m usually always on wifi. If I need data, like when I take longer trips to places without much wifi, they have the option of switching plans up to twice per month. Glad I caught this article, had to do CTRL-F5 to refresh the “classic blog” page as it is still getting cached for way too long. I don’t currently have a republic wireless phone as currently work provides me a phone, but I got a republic wireless phone for my wife and knocked down our cell bill to $25 instead of $100 we were paying before. I’ll have to look in to the moto-G as my wife’s phone is the first generation they came out with (in beta) and it is having issues now. I can’t believe you forgot the most important upgrade…reactivations of old phones. You can now purchase a used republic wireless phone and reactivate it on their network. So people like me who don’t care about having a fancy new phone can grab a used one off of e-bay for a fraction of the cost. Right now I’m with Ting and quite happy and switching would save me a mere $6/month but should the cost difference grow I’ll definitely make the switch. It is there, at the very bottom of the article with ** beside it :) I hadn’t even thought of that option before I read here. The $10 plan is great. I will consider it if I can do without data for 1-2 months on my current Ting plan. I love, love, love Ting. I use a fair amount of text and little cell and almost no data. But now I turned off data all together on my Ting account. If I can manage that then I’ll compare my text/call usage and switch if it makes sense financially. For those of us who don’t need fancy phones the more frugal choice is buying a used Republic phone on craigslist/ebay, now that the company allows reactivations. I had been using the old Defy since December, lost it, and just bought the same one for $30 off ebay in fine condition. The Defy does all the things I need a smartphone to do: call people, text, check email, get directions, facebook, apps, etc. I think it is an excellent choice for people getting their first smartphone, but if you are used to nicer ones you might not like it as much. Only things to be aware of is the camera is not amazing and I think it can only send SMS texts not MMS. Perfect for me since I am not techy or fancy with electronics but I do love a little bit of internet. I think this would also be a great low cost phone/plan option for kids. Last thing to remember with Republic – if you lose/break your phone you have to spend a few days waiting to get a new one sent to you, whether you buy it off ebay or get it from them online. You can’t just run over to a physical store in town and pick one up the same day (which is what I used to when this would happen). So when I lost it I was without a phone for a week – a strange, quiet week. Are there any Republic users in North Dakota on here? We have excellent Verizon coverage, but no Sprint coverage except for the Eastern part of the state (3 hours away). I’ve read I may have to find Sprint coverage to activate the phone. Anybody with experience? Same here in SE Nebraska. There is Sprint coverage 20 miles away from me though. Is the jump from wifi to cell towers smooth? So, if I’m at home on my wifi network and I go for a walk while carrying on a conversation, will I notice the change? I have personally noticed a very small pause sometimes, but it’s never caused me to miss conversation or anything. Before they updated their service, the handover was very sensitive and even though I had a good wifi connection it would switch over to cell during a call. Then I would go to hang up and realize that I had switched to cell without ever knowing it happened most of the time. You can also manually hit the hand-off button so that you are expecting it and not thrown off guard while the other person is speaking. Not sure if everyone else using the service has had similar experiences to me. I’ll second what Debt Hater said. There is a slight click and a very short pause. It’s barely noticeable. I am on Ting now, but when my phone gets old and feeble, I may switch over to RW. I need a home phone because of long conference calls. I use Magicjack now. However, RW would replace MJ and their swarmy tactics. It’s smooth on the Moto X and Moto G. It is not smooth on the Defy XT if you go that route – the XT will disconnect the call and redial if you move out of wifi range. I’m currently using the Moto X on Republic Wireless, and have no terrible complaints about it yet. I’m using the $25 plan, as I’m not a heavy data user and not trying to stream videos or anything so the 3G service works fine for me. I think adding the Moto G to the lineup is the perfect move for Republic. I was a little iffy getting a $300 phone that essentially locked me into the service (even if it was “contract free”) at the time but Republic has fixed those issues and I’m happy with the Moto X. You now have a cheaper solution to enter into Republic AND you can re-sell your phone which means you are not locked at the price of the phone. The only issue I do have with the service is that I’ve found MMS to be hit or miss. It can be annoying since most people have iPhones and group messages send as MMS. I am from Fargo, ND. We use Ting. We do have good 3G coverage for Sprint in Fargo and Grand Forks. My trips to Bismarck and Minot I have not had data. I have good cell/text coverage, but not data. I am guessing that all the western half of ND is the same. SD has virtually no Sprint coverage except Sioux Falls. I do not think Sprint MVNO will be a good option in Western ND unless you are on Wi-Fi. However, if RW allows you to roam on Verizon for Voice, text and data, you might be just fine. You might have to get a “test” phone, grab a new number to verify. If it works, switch over your number. Current service is $165 for 3 Verizon phones . Purchasing a Moto G today to test at $10 monthly. If that works, we’ll sell our Samsungs and buy Moto Gs. Monthly savings $135. That appears incredible! Please write another blog post on this subject in a few months to survey how folks enjoy their savings. That would make Republic a pretty happy company! But no, we won’t convert 200,000 people to Republic fans with this article. Maybe 200 if we’re lucky! Well here is one MMM loyalist who may be part of that 200! Even though I’m in tech as a career, in personal life I’m a bit of a luddite and a MMM frugalista (I’ve been quite happy with my flipfone Tracfone at $10-12 a month)! But this has me intrigued (as I secretly envy all the tools and apps my friends have on their iPhones and Androids but I refuse to pay the $100 a month they pay)! I will check it out (and have my smartphone guru friends review it too). P.S. I’d also appreciate a follow up on how your users who switch rate the new service/phone. Add one more satisfied customer. I bought the Moto G and the 10 dollar plan after reading about Republic on the MMM website. It does have all the tools and apps you could possibly ever want or need but that is not all that important to me. I mainly just wanted a decent cell phone with a cheap monthly rate. Shortly after my post yesterday I ordered the Moto G and had it shipped to my daughter as our test case. One question — We went with the $10 plan. I’m hoping there isn’t a trick where if you use data when on cell that they charge you extra? Will report back in a couple of weeks. She lives in Springfield Missouri. There’s no trick – the mobile data just won’t work on the $10 plan, unless you choose to upgrade to the 25’er. I am getting ready to order the Moto G. It appears from researching online that it will work in Myrtle Beach, SC! Thank you for the aticle we are looking forward to saving money. I am dissappointed that my phone number can’t be transferred due to our location I assume however; the savings will be well worth it I hope!! I have used the Moto G phone for six days and so far so good for me. I even took a 4.5 hour road trip and the phone worked great! When my other family members make the switch we will be saving over $100.00 a month and that is with my husband who has a flip phone with no data switching to a smart phone! Thanks again for the article. Update I am still using my republic wireless phone. My phone worked great from the free WiFi in Dominican Republic(booked a beach front resort with a cyber Monday special all inclusive including room, food and alcohol for $15.00 per person per day). I have also had a person use my referral code and saved $20.00 this way! I am loving the savings on this phone! Count me in your 200 (or 200,000.) I ordered my moto g on Monday, got it on Tuesday, and switched my old Verizon phone number on Wednesday. I am really impressed with the RW online resources and love their welcome video and packaging. I can’t wait to convert my husband. Once we both convert we will go from a $140 a month bill down to $50 bucks. I call that a raise!! Thanks for sharing – your review articles are the only way I would have heard about RW and I appreciate the detail – made it easy to make a decision. I am also a convert, went from crappy HTC phone and Verizon 90$ a month to republic and am very happy overall. They even replaced my phone that had a dead battery for free. I think 200 is a low ball number mmm! MMM – Are you low carbing it? You used to preach the benefit of steel cut oats – but as you know, those still just turn into sugar in your body. But I agree…bread is bad. Post up a few tips if you’ve changed your diet (not a “diet”) plans. I’m a former fatty still working through all of this. Thanks for the tip! Wife picking up the book tonight at the local library! Sounds awesome – I cannot wait until 2015 so that I can make the switch and start saving bucket loads of cash!! You should do the math; it may be worth eating your ETF and switching now! Because of the previous MMM article, my wife and I each signed up for a Moto G on Republic. So far, the $10 per month plan meets our needs just fine. I will probably switch to the $25 per month plan when we travel, but the phones are amazing technology for $149. Making calls on WiFi networks totally works, and when we are out and about, the Sprint network coverage seems just fine in Denver. We were never able to justify the outrageous cost of cell phones from one of the traditional carriers, so moving in to the 21st century wireless phone world at a reasonable cost is really nice for us. Good-bye landline! My wife loves speaking to her phone and saying “Call my sister” or whoever, and it just connects. I like reading books when I am in a waiting room situation. The only problem I am having is that porting my current landline number to the new phone seems to be difficult. Republic Wireless needs something called a PIN number to make the change, and Century Link just scratches their collective head and doesn’t know what a PIN number is. We are still working on this issue; Republic says they will communicate with me soon. Thanks for the great recommendation, MMM! Have you tried using data at all? I live in Denver as well and just got a Moto G for my wife. She doesn’t like smart phones so won’t be using data but I signed up for data initially to see if it would work for me to switch. The 3G data is painfully slow though. I’ve tried it in a couple places around town and have only got about 0.75 Mbps download speed. I’m currently getting up to 10 Mbps on T-Mobile’s network with my Nexus 4. I’m curious what MMM’s speeds are like up in Longmont. I do agree that the voice calling seems to work flawlessly on both wifi and cell so I’m happy about giving AT&T the boot! In practical use, I don’t find much difference in the phone’s usability between when I use it on the <1Mbit 3G data network, 4G in real cities, or my home's 50Mbit wifi/high speed internet setup. At home, a page might load in 0.5 seconds, then you spend a few minutes reading it. On the road, that same page might take several seconds instead, and I still read just as slowly. For email, even less difference. But the speed would become a big deal if you were trying to watch longer YouTube videos or do remote software development using the 3G connection, to be sure. That’s a fair assessment. I suppose I’ve just gotten used to my speedy data. I wonder how having slower data might impact my usage. Maybe I’d be more deliberate about how I’m using my phone and keep it in my pocket more, which wouldn’t be a bad thing. There’s definitely a balance of utility and luxury I’d need to sort out. You could have mentioned this but it doesn’t look like you can get the 4G data plan with the Moto G. It only is available with the Moto X. That is a bummer. Anybody in Central Illinois willing to talk about their experience with RW or Ting? I have looked into both, but confess to being tech challenged and am a 20 year slave of Verizon. Just nervous about not having service when I need it. Although, there have been many times when we were lost in “cell hell” on the Verizon network. Anyway, I would be grateful if someone from my area could share their knowledge. Thanks! My wife has gone through central Illinois with her republic wireless phone and been fine, but she doesn’t use data much, mostly just uses it for voice and text. I soo agree with you about the liberating feeling of not being on the cutting edge! I’m puzzled and fascinated that people think latest is best over something that still works!! For places where the coverage isn’t so great with Republic, I came across another fairly affordable provider called AIO Wireless. Sprint isn’t so great in my area (Indianapolis/Terre Haute), so AIO seems like a pretty good option if you have the same problem. AIO Wireless does not exist anymore. AIO was created by AT&T. AT&T bought out Cricket Wireless and they are merging their prepaid brand into Cricket. Cricket has a very good deal for a group that I have not seen in other carriers (T-Mobile comes close). These prices have the taxes and fees included, so this is the actual cost. The cost per line starts at $35 and goes down to $22 depending on how many people join the plan. This is by far the best offer of any AT&T MVNO. If you must have AT&T coverage and need unlimited talk & text, this is the way to go. You can now have all 5 lines for $100 per month. Also, the data allotment has changed to 2.5GB per line! The 5th line is free. This is very competitive since you are on AT&T towers. 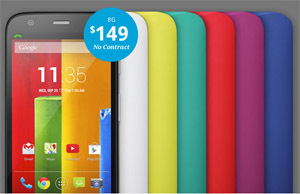 You can also get a Moto G LTE for $25 after a mail-in-rebate (plus sales tax). The Moto G is an excellent phone for the money. Me and my family have joined about 6 months ago and have had a great experience and I thought everyone should know that this option is out there. Would this work for a Canadian? If I signed up in Florida (I can go with my in-laws to their trailer). Use that as the address, and then simply use it in Canada? I know Bell is widely used in my city, so service wouldn’t be a problem. I was wondering this very same thing! Bell is also widely used in my Canadian city, and I live near the border. Sometimes, I even have my service provider appear as Verizon or AT & T instead of Telus. I am also wondering if you have to have a USA address in order to get a Republic Wireless account?? If someone figures this out I would be very interested in dropping Telus. I’ve looked at US carriers in the past and their roaming rates are always just a little higher than a regular plan from a Canadian carrier. I could easily register with a US address despite actually living and working in Canada. I haven’t heard any mention of Aio Wireless here yet. That is the prepaid brand AT&T created as a response to the proliferation of more affordable prepaid operators. I’ve been researching it ahead of a contract expiration later this year for my family of 5. It looks like Aio is pretty competitive as long as you have a group account. They offer “group save discounts” up to $90 for any account with 2-5 phones. If my math is correct, it comes out to $22/month for unlimited talk/text/data on their lowest plan. You can use regular AT&T phones (easier to find 2nd-hand than RW ones, probably), and you get 4G LTE. The only catch is that the LTE speeds get throttled back after 500 MB with the lowest plan (our family rarely exceeds 500 MB of data usage per month anyway since we’re on wifi so much)…but even if you go over you don’t get dinged with a penalty fee just slower speeds. They even have the Moto G for $150! I haven’t investigated into the international roaming though. Anyone else have thoughts on Aio? Unfortunately for me, Sprint has lousy service in my area. One of the reasons why I could never jump to FreedomPop, even though I really wanted to. I’ve had very good experience with the AT&T network for voice and data everywhere I’ve lived (3 states, multiple cities and rural areas). We’ve got a few more months before our contract ends, so I’m interested to see how else things change between now and then. The cell phone market has changed drastically in the last two years since my last contract. Yes, and live in a cave. Not necessarily. If you aren’t a “super-mobile” person, a voip-based landline such as one provided by voip.ms (a Montreal company with SIP servers well distributed across North-America and Europe) would be quite a viable and less costly solution. I, for example have them, and I pay $1.00/month to keep my number and then having a pay-as-you-go concept for both inbound and outbound calls (and which are priced at 1.5 cents a minute – premium option. The value option is even cheaper). I have been with Republic since January and I like it more and more every month because my cell phone bill is only $30 after taxes. If you don’t live in an area where Sprint has good coverage, this is not for you. However, if Sprint is half-decent where you live and you like the Moto X (or the new one) then give it a shot. I think the phone is fantastic– and I traded in an iPhone 5 for the Moto X. People will stop and ask me what type of phone I have. It’s that nice. I wish I had made the switch sooner because I was paying $110/month with Verizon. I recently bought an unlocked Moto G to use on T -Mobile. Thinking of switching to Republic in August when my current contract is up. Would they let me use the Moto G I already have? I’m pretty sure it wouldn’t work. It’s a custom configuration to take advantage of moving back and forth in and out of wifi. Glad to see you are interested in Republic Wireless! As of right now you will have to purchase a new Moto G directly from Republic in order to use the service. Thanks for the comment, Mike! Not trying to be a complainey-pants, but today we are cancelling our Republic service after a few months or so. I really wanted to like it, and thought the concept was (and is) a great idea. I’ll share my experience so that maybe people can see both sides of the issue. After reading about Republic on here, we decided to try it. I ordered the Moto X for my wife (at $299) and set her up with the $25/mo plan. Previously she had an Iphone 4 on prepaid Verizon with 2GB of data for $60/mo. The plan was to try hers first, then if we liked it to buy a second one for me. (That never happened.) Our house has DSL internet (the only option available at our location) and is far from the phone co, so the speed of our home wi-fi is a ridiculously slow 500-600Kbps, at best. Wi-Fi calling does not work at all. At our work, it is also DSL, however we are closer to the phone co, so the speed is about 6mb/sec, and we found while the phone would sometimes try to connect, usually the call would drop out and service was still unreliable at this speed. At my mother in laws house, she has AT&T Fios, (fiber optic service) which is about 30mb/sec, and the phone does work correctly with internet at this speed. So, if you are in a bigger city with super fast fiber based wi-fi everywhere, you should be good. Anything slower than this and you will likely have problems. So, because of our wi-fi situations, most of the time the phone had to be running on cellular service with wi-fi disabled. In any non-fiber wi-fi, (which includes both home and work for us, as well as many local restaurants, etc) my wife would have to disable the wi-fi on the phone in order to try to make calls. However, for the data part of the phone (web browsing, etc) the slower wi-fi works fine, and she would try to switch back to wi-fi for this purpose, to try to limit her cellular data usage in order to help out Republic wireless. We encountered several technical issues, some with the service and some with the phone itself. When my wife would try to call me, my phone would ring for about a 10th of a second and then lose the call. Sometimes this would happen 5 or 6 times before the call would go through so that I could actually answer, meaning she would have to redial my number 5 or 6 times. This would get very frustrating happening multiple times a day. Keep in mind, this was when she had the phone on regular cellular service, not even calling from wi-fi. Another issue we had is that once a call was connected, it would regularly be 4-5 seconds before the caller could hear my wife’s voice. I got used to it, and would just learn to wait before I started talking, however when calling doctors offices, etc, she would regularly be hung up on because they thought no one was on the line in the first few seconds. She would have to constantly call these places back. Again, this was when she had the phone on cellular service (wi-fi disabled or out of range), not even considering the fact that our slow home wi-fi made wi-fi calling impossible. Now, as far as the phone, when we first got it we thought it was awesome. The size of the screen is perfect, small enough to comfortably hold, but big enough to see everything. It’s way better than the Iphone screen which seems tiny these days. And the contoured back of the phone is very ergonomic and feels like it just fits. When my wife had her Iphone, she would regularly keep it in her pocket, which she did for over 4 years. She put the Moto X in her pocket and the screen cracked in less than a week. This is not Republic’s fault of course, you should just know that the glass on the Moto X is much thinner than the Iphone and phone itself does “flex”, it’s not nearly as solid as an Iphone. So, we looked into repairing the glass and it was almost as much as a new phone, so she just decided to use it with the broken glass for the time being (the touch screen still worked fine.) Soon after this, we noticed the battery was going dead after just 5 or 6 hours. Now granted, we have a 4 year old, and my wife gives him the phone to watch videos, etc, and she is on facebook all the time, so the phone is getting constant use, but her Iphone at least lasted ONE DAY without running out of battery. With the Moto X, she had to constantly put it on the charger thoughout the day to avoid the battery running out. I think the phone should at least be able to make it through the day on one charge, even with constant use. Of course she plugs it in every night at bedtime so it’s fully charged the next morning. So anyway, thats’ our experience, for better or worse. If we were on a very limited budget, had fiber based internet at home, and just used the phone occasionally, I might still consider going with Republic, just be aware of the limitations. On the plus side if anyone wants to buy a Republic Moto X with a cracked screen that’s been dropped in water, I’ll sell it cheap. I also don’t let my son (8) play with the Moto X, since I want it to last longer. He gets to use the old iPhone or the Nexus tablet we have sitting around. I’m looking at getting the free Google Fiber (don’t hate me ;) ) and try this phone. But the free fiber is 5Mb/1Mb vs $70 for the 1Gb/1Gb, so your experience concerns me. I’m not sure when my fiber is coming, and I’ll get the phone after that. I’m wondering if you had something else downloading/streaming at the same time of the phone use. There is also a little setting called QoS (Quality of Service), which not all DSL routers will be able to perform. This allows a more stable connection to stream to VoIP (Voice over IP address) devices like the RW phones. I didn’t have this setting until my current DSL modem that I bought about 6 months ago. I have a work network I was going to test this on, and that is 5Mb/5Mb. The other question is how clean is your WiFi area? Android free WiFi sniffer that is pretty easy to use: WiFi Analyzer. How close/many are your neighbors? I can turn on my WiFi sniffer and find over 30 APs (WiFi connections) from my living room, which also concerns me with using RW. This problem is discussed in detail on the forums. The handover settings will send you to cellular if you’re wifi is a little slow. Even slow dsl can still handle the calls and texts though. You can put the phone in airplane mode and turn on wifi to help. This is an inconvenient hack, but it works. I also believe you can change the handover settings on the Moto X, but I’m not sure. There are also a lot of threads about how your router can impact your wifi calling and texting. Might be worth looking into. Chris, thanks for the info. I know that the bandwidth of the voice signal is normally not the issue and should be well under 100kb/s, so the issue lies in the network ability to keep the voice packets fairly contiguous without dropping or losing many. Most newer WiFi routers should be able to perform this function. I know at the enterprise level (about $300 for each AP) we can have about 50-60 devices attached to an AP before degradation of WiFi voice communication happens. After a little more research into this I found that it has been reported back in April that Google is looking to offer something like RW, which means that Google’s routers should be able to handle the WiFi VoIP traffic. Their latest talks are rumored to be with Verizon. It was also reported that Google talked with Sprint last year. Kansas City (Overland Park to be specific) is Sprint’s headquarters, and the first city to get the frugal’s dream ISP (Google $300 for 7 years = $3.57/mo vs. AT&T DSL @ $46/mo; G’s 5/1Mb/s vs AT&T’s 3M/512k b/s). I’m curious to know if any diehard iPhone fans have switched to this. I feel like I’ve invested a fair bit of money (and gift cards) into my iPhone (apps & music) that I’d have an expense to replace those. Also, a silly question, but how do you import your contacts/photos/data from one phone to another?? I truly don’t relish the idea of individually typing in data for 300+ contacts! I switched to a MotoX from a Samsung flip phone and my contacts imported over bluetooth. I would expect you could do the same with an iPhone. You import you contacts via gmail. Music’s a bit more dicey (because of licensing), though there are 3rd party apps you can use. Google Music. All you need to do is install their free app on your itunes-running computer, and it uploads (actually, it just checks to see what songs you have and marks them as playable on their servers for you) and hey presto, all of your itunes music is “in the cloud”. Then with the google music app on Android, you can stream any of it, or if you are going to be a in place with no data access you can download songs or whole albums to the device. I’m no diehard iPhone fan, but I found it much more convenient to keep my iPhone (5-year-old iPhone 3G, off contract), have ATT unlock it, and then switch to an ATT MVNO called puretalkusa. Phone works exactly the same, EXCEPT for the visual voicemail (bummer, that was convenient). I got the $10 family plan +$5 for my wife’s phone, and if we use more than 300 minutes they charge us another $10. That’s no data, but you can also get data plans and unlimited everything plans for $40-45 (each phone). My wife just got an unlocked iPhone 5c, pricey, but I cut down the SIM and it works perfectly–the phone gets paid off in about 6 months when compared to a $90 AT&T bill, and then we’re not locked in for the other 18 months of expensive contract. Extra bonus, when unlocked, AT&T iPhones are GSM, so they work in Europe when you drop in a prepaid SIM card. If you have a Verizon iPhone, I think you need to find a verizon MVNO (essentially a company that runs it’s own mobile service over the big guy’s actual network). Search for MVNO on the MMM forums, that’s where I learned about this. If switching from an iphone, strongly consider accepting a new number from republic. If you port your same number from your iphone, you will likely have glitches with your contacts who own iphones, especially with MMS messaging. There is probably a correct way to make the port and make it less likely that you’ll experience the glitches, but your transition will be smoother if you just get a new number. I have a slightly used republic wireless phone if any is interested text me 682.365.8535. I purchased the Moto G from Republic right when it became available in April. My wife and I have been happy with the service (Chicagoland). We did not have smart phones before, so the Moto G was definitely an upgrade from what we had. We are not smart phone people because we don’t really care about the features; we switched because you don’t have to worry about minute or text limits, which is great. Has anyone tried to (re)activate a RW phone in a mainland state and then use it exclusively in Hawaii, especially rural Hawaii? I’m figuring I could get wireless billing so I don’t really need to have anything sent to a friend’s address and the only hang-up would be that my number would be from wherever I activated it? And any other complaints about switching over from iphone to one of these moto phones besides MMS sometimes not working? I’m trying to decide if there is any advantage to doing that over getting a used iphone that I can use with H2O or StraighTalk. I currently have a Verizon CDMA iphone 4 that an auntie gave me, but there is no way I am going to pay Verizon and I can’t seem to get it to work on Straightalk or any of the other economical carriers. Aloha! Seattle here. Nabbed the Moto X on Republic Wireless and running the $10 plan, and have had Freedom Pop for over a year. Love the phone. Big upgrade over the Iphone 4S. Sprint, however, is not so hot here in Seattle. I’m guessing they sold RW a specific band of their old WIMAX network. Since both RW and FP are Sprint, service can be a little dicey. The headache of not having completely reliable phone service is marginally balanced by only paying $10/mo, but I hesitate to recommend it due to sprint’s failure to upgrade to 4G LTE in Seattle. And even if they did, I’m not positive that the Moto X is configured to access it. My wife would not tolerate the frustration, so she’s still sitting tight with my old iphone on AT&T for $50/mo, which have fantastic Seattle coverage. If I could find a AT&T version of Republic, and I could successfully sell my Moto X, I’d do it. I’m also a bit frustrated that it wasn’t real clear before hand that the RW Moto X works no place else. All in all, happy with the phone, not happy with Sprint and their slow roll out in a tech-savvy city like Seattle. Also, if you are switching from an iphone, Deactivate your phone before switching your number! Otherwise you will have a huge headache with text messages, which will still think your number is an iphone, and send via imessage instead of SMS. And you can’t get imessages on a Moto X. This is more a complaint for Apple then RW or Moto. I’m in Seattle as well and have AT&T and an iPhone 5s. I’m hesitant to switch to Republic Wireless or GoogleFi since I want good coverage around WA state for doing home health PT and going backpacking. So I want AT&T or Verizon-quality coverage. Have you found a good solution for this region? Based on the previous MMM post, my wife and I made the switch this month from Verizon to Republic. Our previous phones were Motorola flip-phones, which we used for voice only. The Moto G is our first experience with smart phones. So far we are both dazzled, but it’s only been a couple weeks. We had no difficulty porting our telephone numbers from Verizon. We used the last four digits of the phone number as the PIN. When calling each other when we are both connected to the home WiFi network, the phones do not work very well. Voice sounds garbled. We have only done this to test the phones. In actual use, there would be no reason to call each other when we are both at home! Calls seem to work fine when we are not both connecting to the home router. The second issue is that the Bluetooth connection to my home phone set is a bit wonky. Recently someone called me. I picked up the home set but could not hear the caller–although the caller could hear me. After two minutes of deep research online, I suspect that the issue might be with the “Voice Privacy” feature. I have deactivated this (from the phone settings menu), and will see if it resolves the issue. Voice Privacy is a feature that encrypts the voice transmission. This supposedly prevents eavesdroppers and phone tappers from listening in. Frankly, nothing I ever say on a telephone call is that exciting. Overall, so far so good. We thank you, Mr MM, for the recommendation to check out Republic. Do you know if Republic Wireless started using short codes? I was considering switching but I need the short codes to access my accounts. Thanks for your comment, Lea! We are not currently using short codes…but be on the lookout for future announcements! Here is a work around that I’ve used to receive notifications from my bank and Amazon. I know this is a Republic Wireless article but I can’t not say something about Ting. Since they both fall into the eff major carriers category I feel like its appropriate. Havn’t used Republic but Ting service is great, switched as soon as I read about it in Mr. Money Mustaches article. Not only do they have reliable service but their customer service is bar none. I mean really, if your a customer of theirs call and see for yourself, or email, or post on their blog. Also I believe them to be one of the more transparent companies about their business practices, this maybe a gimmick but I enjoy it. Lastly while in terms of usage Republic Wireless has a slight edge with the over wifi software, supposedly Ting also has it in the works for later this year. Anyway thanks for the info and release from the servititude to the major 3 carriers. +1 for Ting also. I’ve been a very happy customer since September 2012. I’ve got to also say how much we like Ting. We’ve been on for about a half a year with no problems at all. The customer service is top notch. Whenever I’ve called a helpful human being has answered within one or two rings. We brought over our old Sprint phones, so no new phone cost and our bill went from $180 per month for five lines on Sprint (which included a partnering discount) to about $70-80 per month on Ting for four lines (our oldest is on his own now). When we started Ting we were in Orange County, CA and now we’re in Portland, OR and coverage has been fine. I’ve used Ting and my wife still does (likes a slide-out keyboard). I agree they have the best customer service I’ve ever experienced and RW could learn from that. On the other hand, I went through two used very unreliable galaxy S2 phones on Ting (purchased through Digicircle eBay store, which I do not recommend). So trying to save money cost me money as did my wife’s heavy talking minutes. A few months ago, I broke down and purchased the Moto X on RW and I love this reliable, excellent phone. Perfect size. Cool features, incredible battery life. I’m on the $10 plan. I actually felt a little bad leaving Ting because its service makes you want to give them your business. But they could learn something from RW’s plan pricing and affordable NEW phone offering, just as RW could learn that it’s great to have a number to call for live, friendly help. My experience with Republic Wireless since December has been a nightmare: the calls never really sound clear, almost 20% of my calls are dropped, there is sometimes unusual delay from the moment I speak until the moment the listener can hear what I say, and often when I call someone, the name “Muhammad” shows up on people’s caller IDs. Given that I was using the phone for my sales position, this move to Republic has been an unmitigated disaster: it cost me far more money than I ever saved. After 3 months of this nonsense, I got a new plan with Pages Plus, which I now what I use for work. Yes, it’s more expensive at $39 for unlimited, but the phone actually works. Since my Moto X is now more or less obsolete 5 months after I purchased it, and I’ve had little luck finding a buyer. I don’t know if my experience is typical – I live in a suburban metro area in the Midwest, not some remote area – but I thought others should know that Republic is not always kittens and rainbows. The argument about Verizon for roaming is really empty because instead of switching to Verizon roaming, the phone would often just drop the call instead. I’m really glad that Republic exists, everyone is super nice, I love the simplicity of their pricing, and it’s awesome they are disrupting this industry. But I would NOT recommend this phone for business, under any conditions. I’m sure someone here would be happy to buy your “obsolete” Moto X (maybe even me!). Post your number if you like..
John, feel free to shoot me an email. I’m looking to upgrade from my DefyXT, which served me valiantly for a year. I was going to buy the Moto G, but if I could get the Moto X at a Moto G price, I would be very happy. If you still have your phone, I’d be very interested in buying it. I live in the Midwest too (Wisconsin) and am a student and want to get on a cheaper cell phone plan. That’s funny, I just finished a post on the MOTO G and RW. Need to add some pics and publish it. I’ve been using the G for almost a month and I love it (granted, my previous phone was a 4 year old samsung fascinate). I expected to have some hiccups here and there, but so far so good. I don’t know if there’s a product out there that I can recommend more whole-heartily than the combination of the MOTO G and RW. $150 for a great phone, and $10/month for unlimited calling and text. What else is there to say??? I use my phone in remote areas of NM during the summer months. So For further clarification about Republic Wireless. Do they roam on all Verizon towers, or just on the areas shown on Republics map? I’ve been with Republic for about two months and so far everywhere Verizon shows coverage I’ve had service. Also, I think Republic has roaming contracts with all CDMA carriers not just Verizon. Hey Larry, thank you for your questions. Republic works with any of Sprint’s hundreds of roaming partners. So, it will default to the closest roaming tower near you, whether that is Verizon or a different company. Hope that helped! Do they use all Verizon towers for roaming or just some of them? I’m currently running an experiment on a 2010 model iphone 3GS to see how long it will last. So far, so good. But we’ve enjoyed our last software update, which might bring the “death of incompatibility”!! Thanks to your engineer produced comparison of the two Motos, the iphone now has a succession plan! They look good! In terms of smart plans (NZ), one of the cheapest seems to be with 2 Degrees at $19 p/m. The big bad is the cost of the internet combined with the mobile cost. Example: $55 for 80 gigs p/m, but your mobile has to be linked and ‘on account’ in order to get this deal. The cheapest on account monthly plan is $29. Otherwise the cost is $85 for 80 gigs internet plus your ‘not on account’ mobile costs. On account plus internet deal: $55 + $29 = $84. Over one year this is $1,008. Over ten years this is $10,080. Off account plus mobile $85 + $19 = $104. Over one year this is $1,248. Over ten years this is $12,480!!! That’s eye watering stuff. If the cost of mobile was $10 p/m (Republic): $10 + $85 = $95. Over one year this is $1,140. Over ten years this is $11,400. Still a hunk of change, no matter the mobile cost! Dial up internet plus Republic $10 + $10 = $20. Over one year this is $240. Over ten years this is $2,400. $10 plus $19 = $29. Over one year this is $348. Over ten years this is $3,480. We have Motos, and I know which one to go for thanks to this article, but is there any chance of getting Republic over here? By the way, NZ is a lovely country with great scenery and volcanoes, and geothermal hot pools that soak your aches away. And we still have a glacier or two! There’s not many people over here and the lifestyle is gorgeous. We’re pretty much close to a beach wherever we go! Before the internet/email we had snail mail. Before snail mail we had pigeon post! I’m not joking!!! Cute, huh!? Republic’s technology may very well be brought to other places – we’ll see – but Republic’s model is also partially based on the fact that Sprint is trying very, very hard to attract MVNOs – you have everything from low wholesale costs to turnkey solutions that allow just about anyone who wishes to start one. Thanks Space, that’s good to know. Say I live in another country (not Canada) for 11months out of the year. Can I make calls to the US and other countries (on Wi-Fi) free of charge? I think you can based on your article- I just wanted to make sure before I took the plunge. – call to within the US (and Canada) are free and unlimited. – calls to other countries than these will require another method. Republic has no way to charge you more than your flat monthly bill. So you can’t be in, say, Germany and call the restaurant next to your hotel using the basic calling feature of the phone. To do that, you could get a free Google voice account which can make cheap international calls, for example, or use the Skype-to-landline option. Then use your Republic handset as the device to make that Skype/GV call. Do you happen to know if any of their supported phones have an option for two SIM cards? That way, it’s possible to get a local SIM card while still being able to use the same phone. Because I use data and texting a lot more than I do voice calling, I’ve been very happy with T-Mobile’s Unlimited Data/100 Minutes prepaid plan at $30/mo (and I pay $15/mo to add tethering ability, I travel a lot for work, and hotels/airport wifi is usually both expensive and bad). The LTE/4G service is extremely fast, and since I’m almost always in major cities, I’ve generally been very happy with T-Mobile’s reception. I love the fact that because it’s prepaid month-to-month, I can try out other carriers at will to see if one of the MVNOs is a better deal (Google Voice lets me reroute calls from one to the other with a few clicks). I’ve tried switching once already (to Straight Talk), but I came back almost immediately. Also, more than any company, T-Mobile is pushing the other carriers to enact more reasonable policies and stop gouging people so much, which I’m happy to support. Highly recommend a try if you’re in an area with decent T-Mo coverage. PS: In order to make the 100 minutes work comfortably, I also got an Ooma – $120 up front on Amazon, but then $3/mo unlimited VOIP calling with wonderful voice quality. I actually prefer talking on that while at home, it’s like having a landline again, with all the audio quality that a landline brings. If you already have the $30 dollar plan from Tmo (which I use) you might want to pick up a google nexus. The 4 doesn’t have 4g service, but the 5 does, and you might be able to pick one up used for less than the $350 price. You don’t have to pay to tether with either of these phones, so it would save you 180bucks a year. Tethering with the 4 on 3g is pretty fast for me. I use google voice on the computer or groove ip on the phone to not use minutes up if i know i’m going to need to make a long call, which is hardly ever. I switched a bit over a year ago and have only run out of my 100 minutes one month. It is possible for current RW subscribers to give referrals to new customers. If the new customer pays for service, each of them receive $20 credit (up to $600 max for referrer). Do you have a link that offers any similar benefit for yourself or your website? If not, I would like to set up a forum thread where existing and new customers can contact each other for purposes of getting these credits. Again, I would only do this if it doesn’t take business away from your site since it was how I found out about RW in the first place. Thanks. If you go back to the first page, a lot of people have gotten skipped as the new posters have failed to follow the procedure. We just got our Republic Moto G in the mail yesterday. We’re planning on using it as a home phone to replace our landline. At the rates we’ve been paying, it ends up significantly cheaper– even including the cost of the smartphone! Republic: $7.10/month (the $5 plan), since we really only need a home phone anyway; $205 (16GB phone plus tax/shipping) depreciated over a year is $17.08/month. Total actual cost per month: $24.18. Monthly savings of $3.50. Even nicer, though, is the fact that we will actually reduce our monthly cash flow by $20! That’s money that can go directly into savings. Same issue we have here. 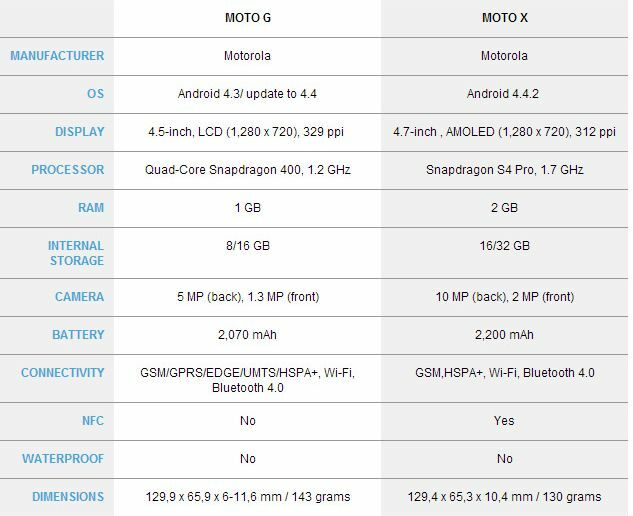 I am trying to decide Moto X or Moto G. I really would not like to spend so much more for the Moto X but I like the feature where it is able to tell if you are driving. I too am leaving VZW when my contract is up in a few weeks and we too sped $329 for 2 months of service with VZW!